3/4 x 5/8-inch Sterling Silver St. Florian Medal. Padre Pio of Pietrelcina (1887-1968) is probably the best-known saint of our times. A stigmatist since 1915 when he received the invisible wounds of Christ, he bore these marks visibly from 1918 until his death. Padre Pio possessed remarkable gifts, including celestial perfume, the reading of hearts, bilocation, prophetic insight, miraculous cures and remarkable conversions. Plus, he could smell the stench of sin in penitents. 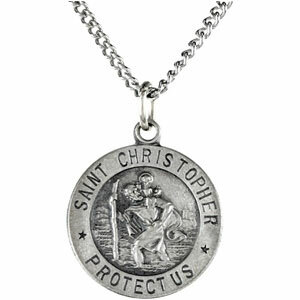 This Sterling Silver Round St. Christopher Pendant Pendant with Chain has passed our quality control assessment and meets our strict criteria to be a Catholic Shop product. Buy with confidence. Catholic Shop aims to carry the finest products on the market. Our staff has inspected and tested this Sterling Silver Round St. Christopher Pendant Pendant with Chain and found it to be worthy of our Satisfaction Guarantee.